Obscene or filthy language in speech. 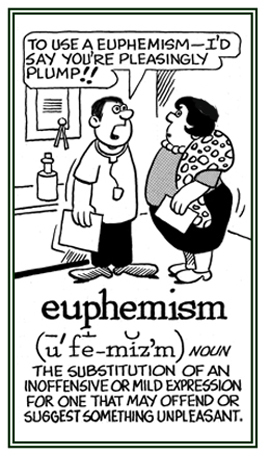 A term for substituting a mild, indirect, or vague term for one that is considered harsh, blunt, or offensive. 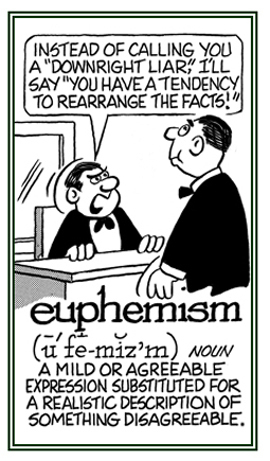 A British spelling version of euphemize. A reference to the use of an acceptable word or phrase to avoid saying another word or phrase that may be unpleasant or disrespectful. Characterized as a softer or more pleasant expression to describe someone or something. 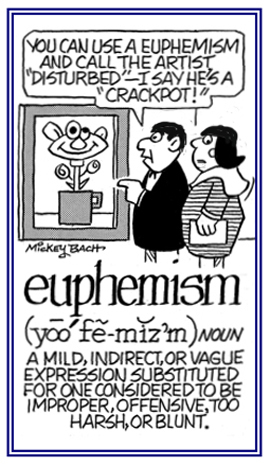 The substitution of a harsh or blunt expression for one that is mild, indirect, or vague. To avoid saying, or writing, something direct, harsh, unpleasant, or offensive by using milder or more indirect language. 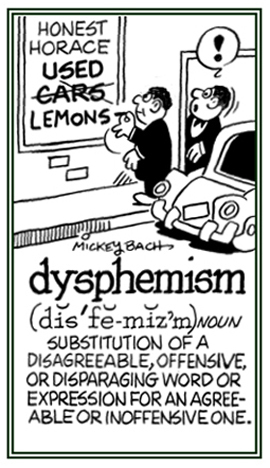 A reference to anyone who makes a substitution of an agreeable or inoffensive expression for one that may offend or suggest something unpleasant. 1. Any of a set of written symbols, letters, or combinations of letters that represent the same sound, e.g. “f” in fat, “ph” in photo, and “gh” in tough. 2. A written symbol that is used to represent speech. Showing page 2 out of 3 pages of 40 main-word entries or main-word-entry groups.